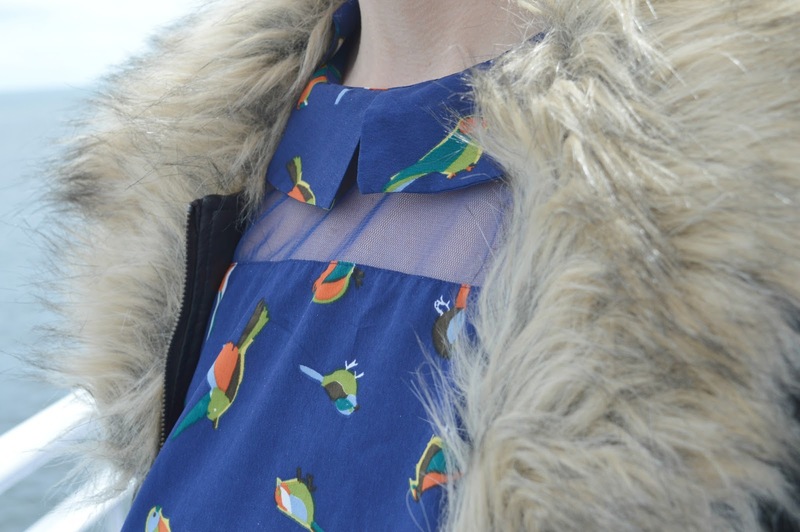 Sadly Frock Swap has come to an end with my last package arriving in the post, Donna's gorgeous brightly coloured bird print dress. You can see how Donna styled it here. I've learnt a lot during Frock Swap, mostly about how I always play it safe with my clothes. I thought that styling outfits was pretty easy but putting on other people's clothes with the intention of creating something fabulous and fresh was trickier than I thought. I've realised I live in a world of everything being matchy matchy, and I should maybe occasionally step out of my comfort zone with some colour clashing. 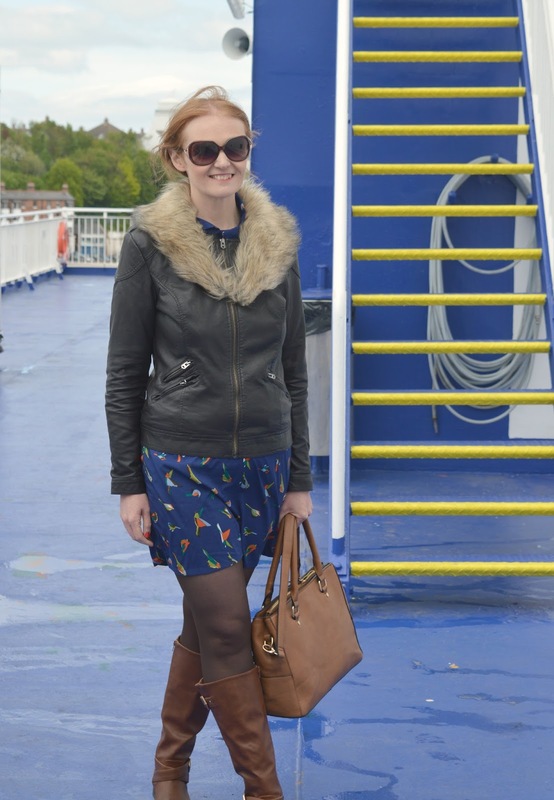 Lucky for me, this was very much a "Chloe dress", so much so that I cheekily took it out for the day and wore it on my North East cruise with DFDS ferries. I had a few compliments on my dress that day which made me smile, I wasn't sure how to begin to explain that it wasn't actually my dress! When I'm styling with dark blue I tend to lean heavily towards brown accessories, again with the matchy matchy it's a pretty safe way to wear it but it works. It was a typical British Summer's Day when I took the frock out for the day, warm and sunny one moment and breezy and overcast the next. I decided to wear it with my chocolate brown "leather" jacket from Primark. I love this jacket although Simon likes to tell me it's identical to my black jacket (not true!). The fur trim adds a certain element of glamour to the dress. I love that the dress is appropriate for all seasons and kept me at a perfect temperature all day. The three quarter length sleeves kept the chill away but it was light enough to keep me cool when the sun came out. Perfect! 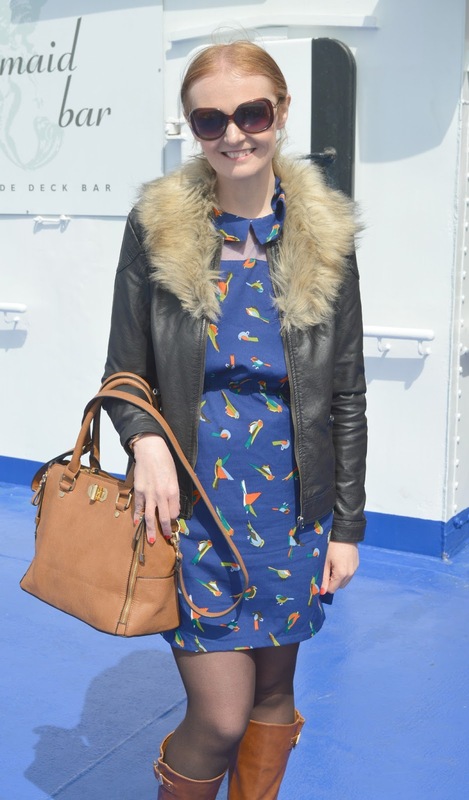 This beautiful bird print dress went on an adventure at sea, had some afternoon tea and watched a Michael Jackson tribute - by the end of the day I'd forgotten it wasn't actually mine! Luckily, Donna was pretty quick to realise that I'd fallen for the frock and has kindly let me keep it. Thanks Donna! How would you have styled Donna's dress? Ah gorgeous dress, looks like it could be really versatile and wear it with layers when its colder but also be amazing when the suns out! So, weird comment of the day, I know I don't know you in the real world but this dress looks completely and utterly 'you'! And you look great in it. Bravo.